The first step (since I am an SP dude) is to add SiteGroups and their permission levels. 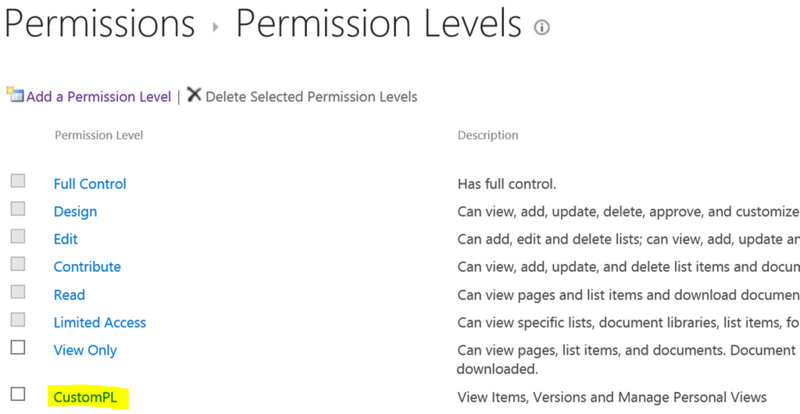 Also you can create Custom permission levels. To create your own permission level I prefer to use GUI -notice that I have created a Custom permission level with read on items and versions, and the possibillity to manage personal views. Next step is to add SiteGroups and their PermissionLevels, to do this I use a comma separeted file, and import this with PowerShell to the sitecollection. -first line is the references to PowerShell –scope, the permission level must exist (and offcourse url to site), groups will be created. Notice that some of my Groups allready existed, and you get a red PS Error –that’s no problem, the new ones will be created. PS>Remove-SPOSiteGroup -Site https://vaerpn.sharepoint.com/sites/github -Identity "Administration Visitors"